"The NFL is having a good year — relative to last year and certainly relative to the TV environment as a whole," said Robert Seidman, founder of the website Sports TV Ratings. Coming in to the 2018-19 season, the storylines were stacked against the NFL. Protests from players were fueling political debate. Concerns about concussions had many questioning the future of the sport. And people are tuning away from television and to streaming services. Five weeks in, the league and its media partners can breathe a sigh of relief. TV ratings for NFL games have ticked up slightly in the first five games this season, adding 3 percent more viewers than in the same period last season, according to data from the measurement firm Nielsen. While it might sound meager, the increase is far better than the ratings of the past two years, in which the NFL endured a decline in total viewers of 9.7 percent for the 2017-18 regular season and an 8 percent drop for the 2016-17 regular season. "The NFL is having a good year — relative to last year and certainly relative to the TV environment as a whole," said Robert Seidman, founder of the website Sports TV Ratings. "But what will happen with the TV environment — that remains to be seen." The ratings are a bit of good news for a TV industry that continues to deal with dwindling viewers, particularly in younger demographics. The NFL has not been immune to that trend, with viewership in the first five weeks down 5 percent among adults aged 18-34. The league has been helped so far this season by close games and an infusion of young talent, according to TV executives who spoke to SportsBusiness Daily. 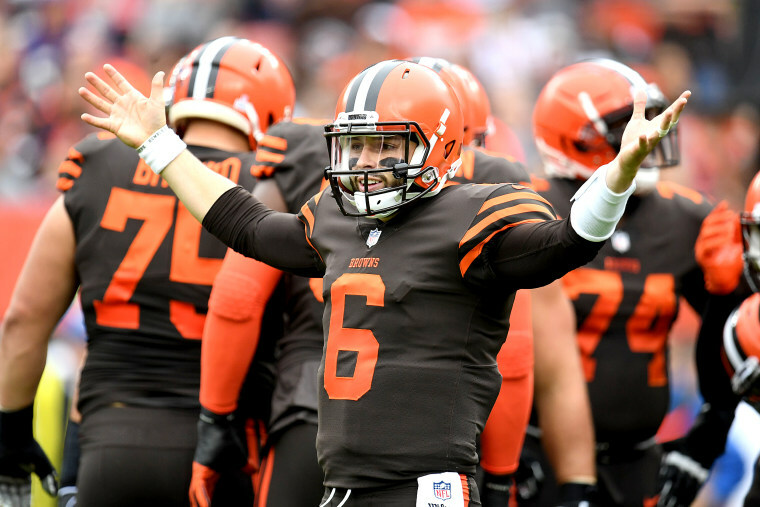 Even the hard-luck Cleveland Browns have been surprisingly competitive, with an exciting new quarterback generating some buzz. Before the season began, the NFL's most vocal critic, President Donald Trump, renewed his attacks on protesting players and the league, leading to worries that viewers may take the president's words to heart and stop watching. So far, the evidence of Trump's impact is scant. An in-depth analysis of "Sunday Night Football" viewership by USA Today found that any decline was more than offset by "football reasons" — particularly, if a city's team is any good. The national anthem protest started in 2016 with Colin Kaepernick, then quarterback of the San Francisco 49ers, who said it was his way of protesting police brutality against people of color. With no team signing Kaepernick this season, other players have carried on: Miami Dolphins receivers Kenny Stills and Albert Wilson have taken a knee during the national anthem each week, and Carolina Panthers safety Eric Reid, who played with Kaepernick on the 49ers, took a knee on Sunday in his first game of the season. Thompson said that the protests have not upended the league's overall popularity, and that the positive swing in ratings is an "indication of stability."